Elasticsearch, Fluentd, and Kibana, or EFK stack, is an industry standard for collecting, storing, and visualizing Kubernetes logs. Fluentd collects the Kubernetes containers logs and transmits them to Elasticsearch. Elasticsearch stores the logs and exposes them through a RESTful API. 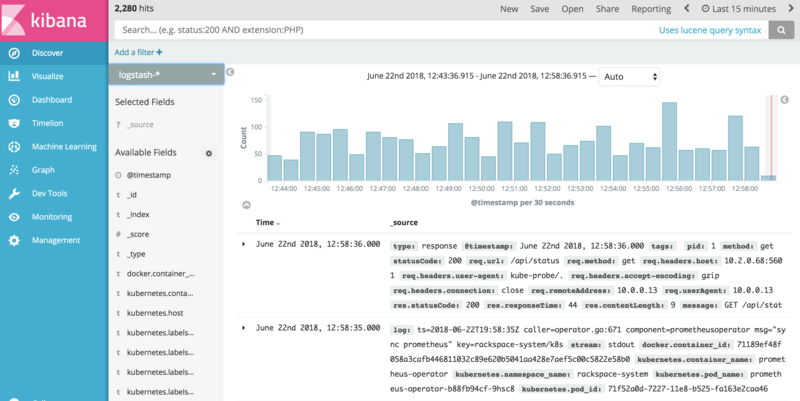 Kibana provides a graphical representation of the collected logs along with filtering and search capabilities. All components of EFK are deployed as Kubernetes Pods in the rackspace-system namespace. The default retention period for Elasticsearch logs and data is seven days. If your organization requires you store such information for an extended a period of time, contact your Rackspace representative or submit a support ticket. You can access Kibana by using your Managed Services credentials and the URL listed in Access the Rackspace KaaS dashboards. To view and visualize the logs You need to configure index patterns. By default, Kibana suggests using the logstash-* index pattern. You can use the default setting or configure additional patterns as needed. Log in to the Kibana UI using the URL and credentials provided in Access the Rackspace KaaS dashboards. Go to DevTools > Console. Alternatively, you can use curl -XGET "http://<path-to-Kibana-UI>_cat/indices". Click Management > Index Pattern > Create Index Pattern. Configure the default logstash pattern or a custom pattern as needed. In the left navigation panel, click Discover to view the logs. The EFK stack provides rich capabilities to configure logging. For more information, see Kibana documentation, Fluentd documentation, and Elasticsearch documentation.